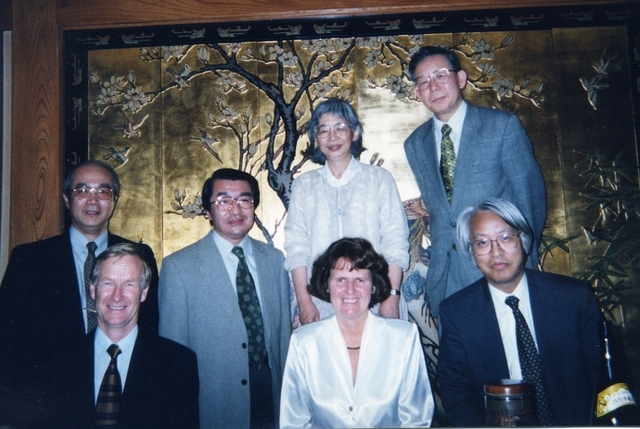 At the 50th Anniversary of the Japanese Crystallographic Association (CrSJ) in Tokyo, 2000. Rear: ?, Yasuhiko Fujii, Fujiko Iwasaki, Michioshi Tanaka; front: Ted Baker, Heather Baker, Yuji Ohashi. At the 50th Anniversary of the Japanese Crystallographic Association (CrSJ) in Tokyo, 2000. Yasuhiko Fujii (Chair, National Committee of Crystallography), Fujiko Iwasaki (President, CrSJ), Norio Kato, Michioshi Tanaka (Vice President, CrSJ), Yuji Ohashi (President, IUCr).